Black Friday is that time of the year when we all go crazy for shopping, and that is amazing news for all the retailers who have their products online. As the number of e-commerce users grows, they start experiencing the same problems they used to suffer while going to brick and mortar locations. Collapsed websites and slow page load are the new lines outside a store and the fights with other people to get the TV with 70% discount. Discounts shouldn’t mean poor UX and while in the past users’ complaints wouldn’t go far, today, due to Social Media and messaging apps, complaints can go viral in minutes. To avoid this problem, companies should find a way to balance great customer experience and profit. 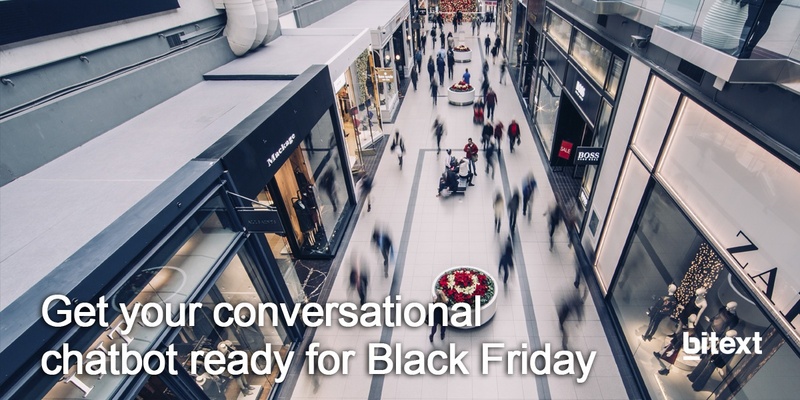 While brick and mortar locations can hire more employees to help in busy periods such as Black Friday, Christmas or Sales, online retailers must find new ways to interact with their customers beyond their website, and here is where chatbots can make the difference. Luckily for us, we are in AI’s era, and we can take advantage of the latest products and features in the market to achieve our business goals. There are many tools we can use to increase customer satisfaction, but there is only one that allows instant and personalized communication without spending tons of resources. Interacting with your chatbot can save your customers a lot of time when purchasing a product. Instead of going to the store, spending time looking for it and then waiting in line, conversing with a bot allows customers to purchase a product within minutes. However, this requires some advanced functionalities on the chatbot’s side —above all, the ability to converse. Based on the current state of chatbots, what customers fear the most is not being understood by an AI-powered application, and that is why having a conversational chatbot will make any retailer increase its sales in comparison to its competitors. At this point, you might ask this question: what is a conversational chatbot? One that can understand customers without making them speak like robots, and allows users to talk away from the predefined options showed in buttons. Simply, those that can be similar to a salesperson or shop assistant. Imagine how many salespeople you will need to handle hundreds of clients in one day. Any conversational chatbot will be able to do the same for your online shop without problems. On days like Black Friday, as more and more people choose online shopping to avoid the hassle of overcrowded stores, it is essential to have a good “AI sales chatbot” to attend their needs and maximize the profit. Creating this kind of intelligent chatbot is no simple task, but we know how. If you want to see how exactly you can profit from implementing a conversational chatbot for your business, feel free to contact us.